Our 8.5" height Step Stool features a non-slip grip, allowing your child to gain confidence while potty training. The stylish aqua color can be used both for boys and girls, & can hold up to 250 lbs. The perfect height for toddlers to reach the toilet for potty training or the sink for washing their hands. Lightweight with handles on each side so your child can place near the toilet, sink, or anywhere else they need. 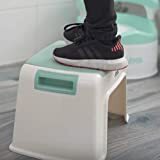 EXCLUSIVE LIFETIME MONEY BACK-GUARANTEE: If at any given point you're not 100% satisfied, we'll offer you a prompt and full refund of our Kids Step Stool!